This lighter version of a southern classic is sure to be a hit with the whole family. Place graham crackers in zip top plastic bag or between two pieces of foil and crumble, using the unopened can of peaches as a rolling pin. Add graham cracker crumbles and sugar to melted margarine and stir to mix. Open can of peaches and drain off liquid. Heat peaches until warm, 1-2 minutes. 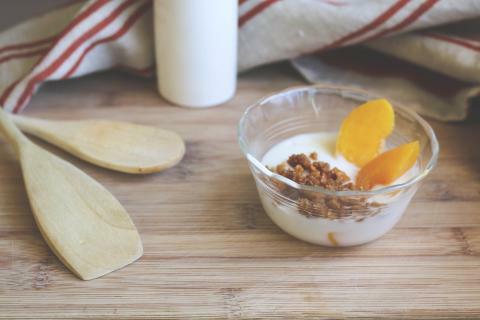 Pour 1/2 cup vanilla yogurt in each of 3 small (1 cup) bowls. Top each bowl with 1/3 of warm peaches. Top peaches with 1/3 of graham cracker crumbles and serve. Follow steps of recipe, but melt margarine at half power (5) in the microwave, about 20 seconds. Heat peaches in microwave-safe bowl, about 1 minute. Stir. Check to be sure peaches are not too hot before serving to children.